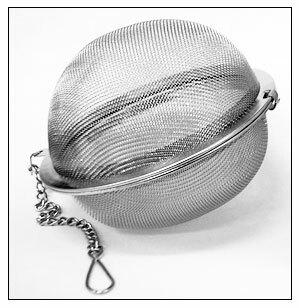 This stainless steel tea infuser ball offers an easy way to brew loose-leaf tea. Simply fill this ball with a spoonful of your favorite loose leaf, close it up, and steep just like a teabag. The 2.75-inch diameter gives the tea plenty of room to expand in the ball, giving you the perfect cup every time. This mesh ball is easy to clean, as well. Simply open it up, shake the used tea out, and rinse well. Enjoy your favorite teas all the time, without any hassle. Brew your loose-leaf tea with ease. Comes with a hook to hang on teapots.